Pakistan figured as the only Muslim majority country as a potential superpower in 2011 Arab Public Opinion Poll survey conducted by Professor Shibli Telhami, senior fellow at the Saban Center for Middle East Policy at Brookings Institution. The poll surveyed 3,000 people in Egypt, Morocco, Jordan, Lebanon, and the United Arab Emirates in October 2011. 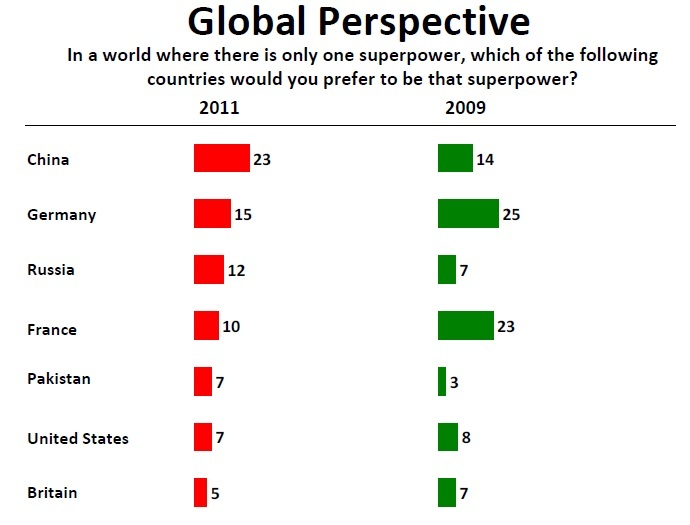 Asked if there could be only one superpower in the world, which country they would prefer it to be, China was favored by 23% of the respondents (up from 14% in 2009) followed by Germany 15% (down from 25%), Russia 12% (up from 7%), France 10% (down from 23%), Pakistan 7% (up from 3%), US 7% (down from 8%) and Britain 5% (down from 7%). In answer to another question about the preferred country they would like to live in, France topped the list with 28% (down from 36% in 2009), followed by Germany 22% (down from 25%), Britain 15% (up from 10%), China 11% (up from 9%), US 10% (up from 5%), Russia 4% (flat) and Pakistan just 2% (up from 1% in 2009). 1. Turkey is the biggest winner of the Arab Spring. In the five countries polled, Turkey is seen to have played the "most constructive" role in the Arab events. 2. Overall, Arabs polled strongly take the sides of the rebels against the government in Yemen (89%), Syria (86%) and Bahrain (64%). But there are regional differences. Those polle din the UAE mostly favor the government of Bahrain. The Lebanese are divided on Syria; the Jordanians are divided on Bahrain; and the Egyptians' support for the rebels in Bahrain is weaker than their support for the rebels in Yemen and Syria. 3. While a majority of Arabs polled continue to express unfavorable views of the United States (59%) the number of those who have favorable views has increased from 10% in 2010 to 26% in 2011. This improvement could be related to the perception of the American handling of the Arab Spring. 4. A majority of Arabs polled (52%) remain discouraged by the Obama administration's policy in the the Middle East, though this is down from 65% in 2010 and up from only 15% in 2009. Coming back to the idea of Pakistan as a potential superpower, it is not as far-fetched as it may be appear to some who currently see it as a nation beset by multiple serious crises. Pakistan is a very large country. In fact, Pakistan is one of the largest countries in the world. With population exceeding 170 million, it is one of only eight nations armed with nuclear weapons. The nation ranks as sixth largest in population, seventh largest in its army size, 7th largest diaspora, 8th in number of mobile phone users, 9th largest workforce, 10th in educated English speaking population, 17th largest in number of Internet users, 27th in economy and 34th in land area. Today, Pakistan's economy is the 27th largest in the world. As Part of "the Next 11" group of nations, it is one of the top 15 emerging economies (BRICs+Next11) picked by Goldman Sachs. Goldman forecasts Pakistan to be among the top 20 biggest economies in the world by 2025. With rapidly declining fertility and aging populations in the industrialized world, Pakistan's growing talent pool is likely to play a much bigger role to satisfy global demand for workers in the 21st century and contribute to the economic well-being of Pakistan as well as other parts of the world. Pakistan is NOT the 27th largest economy in the world. PPP sounds good, but doesn't matter much on the ground. It is nominal GDP that matters. Pakistan's potential is undisputed but it must jettison its corrupt leaders ASAP. Pakistan should have a caretaker government installed now and hold new and fair election in 6 months. Anon: "And who cares what the Arabs think, anyway... They are still fighting to bring their countries out of the 7th century..."
From your comments it's clear to me that you are a right-wing Indian bigot of the RSS variety. Your comment is really strange...especially considering the fact that your country India has the world's largest population of poor, hungry and illiterates reminiscent of the medieval period. India also leads the world in open defecation, and it tops the world in terms of the number of child marriages and its unfolding massive female genocide that has claimed tens of millions of baby girls in recent years. Killing of baby girls was a practice common in the pre-Islamic period of Jahiliyah, and Islam put a stop to it in the 6th century, but it's still widely practiced in India today. You missed a subtlety, Riaz. The survey asked Arabs which country they would prefer to see as a superpower, not which country they consider as a potential superpower. For instance, I would prefer to see myself as a billionaire. That does not make me a potential billionaire, does it? Shamit: "The survey asked Arabs which country they would prefer to see as a superpower, not which country they consider as a potential superpower." I'm afraid you missed the key difference between articles "a" and "the" in the question. 7% of the respondents didn't just say they want to see Pakistan as "a superpower". They said they prefer to see Pakistan as "the superpower" in a world with only one superpower. "Pakistan is too nuclear to fail", said Congresswoman Michele Bachmann, a US Presidential hopeful and a member of House Intelligence committee during the Republican Presidential debate last night. The phrase "too nuclear to fail" actually originated from a piece written by Brookings' Stephen Cohen published earlier in 2011. Riaz: Don't you have any thing better to do? Liaqat Ali gate, east pakistan gate, ... NRO gate, OBL gate, and now memo gate! Pakistan is nothing but a self inflicting gated community. Moazzam: "Liaqat Ali gate, east pakistan gate, ... NRO gate, OBL gate, and now memo gate! Pakistan is nothing but a self inflicting gated community. Pakistan has accomplished a lot, and will do even better in the future, in spite of all the problems you talk about. Sir, you are leading and marching ahead and waving your flag in tandem; however, there is hardly anyone behind you! I will give a lot of credit to Pakistani people for the future years, if today they could topple the current regime like Egypt or other Middle Eastern countries. Sher: "I will give a lot of credit to Pakistani people for the future years, if today they could topple the current regime like Egypt or other Middle Eastern countries." Whether you like it not, the fact is that unlike Egypt Pakistan is a democracy with a govt people freely elected in 2008. I don't know if i should laugh at you or pity you. A bit of both maybe. Superpowers head a world order. Advocates such as yourself are busy defending what's left of pak from being termed a failure. Superpowers exert influence the world over. Pak can't hold it together within the country - nwfp, baloch. The very existence of bangladesh, with less than 2 weeks of indian intervention should tell you enough about pak's influence. The adoption of 'bleed by a thousand cuts' strategy of employing terrorist cells to wage war, should tell u about pak army's confession of india's superior conventional capabilities. Superpowers are economic powerhouses. Till very recently, the imf was dictating terms to pak on fiscal discipline. Superpowers exert control over iternational waters and traditionaly have vast navies. Pak can't even fvelop its own ports. If not for the chinese, gwadar would have been a dream. Barely a brown water navy, it has no muscle for power projection. Superpowers are role models for human development. If i'm not mistaken, over 130 countries rank higher as per the latest hdi rankings. Superpowers command alliances of countries. How many nations does pak lead? It's barely able to create ripples in multilateral forums. Superpowers help shape popular culture the world over. Sure there are cultural exports from music to food. But it's feeble at best when compared to chinese food, bolywood movies or american pop music. There are so many other parameters that make ur claim of pak as a potential superpower. 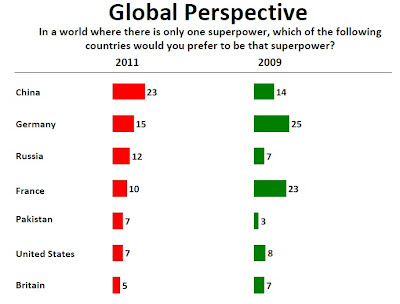 But none more so than than this - superpowers have an unquestionable lead over other nations. You really expect the likes of us, germany japan, brics, australia to be silent, inactive spectators? Wake up mr. Haq. You are in dreamland. Ashmit: "Wake up mr. Haq. You are in dreamland." Recently, well-known Indian diplomat and MP Sashi Tharoor said, "India is super poor, not a superpower". So if your fellow Indians think India, home to the world's largest population of poor, hungry and illiterates, is a superpower, why can't Pakistanis dream of becoming a superpower? Sashi Tharoor is a failed MP who got unceremoniously booted out having made 'technically correct but morally wrong' money by the IPL franchise root. Anon: "Sashi Tharoor is a failed MP who got unceremoniously booted out..."
I know. Straight talking Indians like Tharoor who mention the taboo words and phrases like "India's poverty" and "India's Israel envy" are not acceptable to Indians like you. The list of unacceptable Indians also includes Arudhati Roy, who talks about Indian Military occupation of Kashmir and India's sham democracy, and Pankaj Mishra who challenges Zakaria's description of India as "prosperous and peaceful", and Yoginder Sikand who documents atrocities committed against India's Muslim minority by India's state. In 1980 Pakistan was 21st largest and India was 12th. As stated in 2010 world bank report Pakistan is 28th and India is 9th in nominal GDP. In 1980 Pakistan per capita GDP nominally was $300 compared to India at $260 (1978 prices). At 2010 prices, Pakistan is at $980 and India at $1200. Compared to the progress made by rest of the world on average Pakistan has fallen behind. When and if Pakistan gets better in the future, people including myself will applaud - in the future. Riaz, please respond as long as it is not about defecation and poverty in India. Although you may have a point I've read it ad nauseum in your blogs. The Economist survey calls India a flawed democracy (definitely true), but Pakistan is not even considered anywhere near democracy. Do you see how deep democracy runs in India? Its elections and civil liberties beat those in countries like France and USA. In fact, show me one more third world country that comes close to Indias stellar scores. India is the only third world nation that is a real democracy...and when you notice that India has 1.2 billion people and more diversity than any nation on earth, you should appreciate the magnitude of success of the Indian experiment with democracy. Instead of jealousy, face the truth and try to make sure that the Pakistani people have freedom and civil liberty. Anon: "Also, in 3 of the 5 criteria considered, India receives stellar scores"
These scores have absolutely no relevance for the 200,000 Indian farmers who have committed suicide in the last 10 years. These scores have no meaning for 54% of India's population that still defecates in the open fields and on railway tracks. India is a sham democracy. In fact, it's the world's biggest oligarchy dominated by 55 billionaires who control 1/5th of India's GDP and pay the politicians to do their bidding. In 2008, British minister Douglas Alexander contrasted the rapid growth in China with India's economic success - highlighting government figures that showed the number of poor people had dropped in the one-party communist state by 70% since 1990 but had risen in the world's biggest democracy by 5%. Iqbal Singh: "At 2010 prices, Pakistan is at $980 and India at $1200." Let's talk some real data from official Indian and Pakistani sources. Per capita income in both India and Pakistan is the same...about $1250, according to data released by Economic Survey offices of both South Asian neighbors. Even after the slowdown in 1990s and since 2008, Pakistan's avg growth since 1947 has been 5% per annum, a lot higher than the so-called "Hindu rate of growth" in India for most of its history. The numbers from the Economist that I showed you at least have some meaning. Your post is about some Arabs in some survey who wanted to see Pakistan as the sole superpower!! Tell me, what relevance does this wishful thinking of just 7% of Arabs in one random survey have for the Pakistan that has no economy, no industry, no educational institutions? If Pakistani economy is so impressive and you are so optimistic, how come Pakistan is still barely in the top 50? Pakistan is 6th in population, isnt it? Even if you use PPP(which has little real world relevance), India with 2nd position in population has moved to No. 4 in economy. With 6th position in population, why is the Pakistani economy still at No. 27? If we are a failure despite being No. 4, why are you optimistic about No. 27? Let me see if you are intellectually honest enough to dare publish this comment. Anon: "If we are a failure despite being No. 4, why are you optimistic about No. 27? " India has very heavy albatross of hundreds of millions of desperately poor and hungry population. To get a sense of the enormous challenge, let us understand that India will not reach its Millennium Development Goal on sanitation before 2047, while Bangladesh, Pakistan and Nepal will not achieve the target before 2028, according to a United Nations report released on the eve of World Toilet Day 2011. What's a "sham democracy"? Is there a webster definition of it or is it a term born out of envious mind of Mr. Riaz. Pakistanis, many of them, don't quite understand how democracies work. First and foremost it is an imperfect system; nonetheless, alternatives are lot worse or better systems exists only in theory. Second, democracies are constantly evolving and are works in progress. Third, it is a system of checks and balances. Social ills exists in ALL societies from child abuse to racism to murders but there are forces fighting these ills as well. Democracies are NOT utopian and thus cannot REWIRE the evil side of the human brain that unfortunately exists. Riaz, are you helping or making world around you better, or are you creating more animosity -because if you are doing the latter then you qualify as a "sham" human being in my book! Rahul: "Pakistanis, many of them, don't quite understand how democracies work. First and foremost it is an imperfect system; nonetheless, alternatives are lot worse or better systems exists only in theory." Indian democracy is only skin deep. What you have in India is a copycat system of democracy that is unsuitable for a poor backward third world country like India where most people are divided by castes, classes, regions, ethnicity and religions. Among the poorest and least developed in the world, they live in medieval conditions characterized by widespread open defecation. The basic reason for democracy's lack of solutions to India's basic problems is that its principles have been formulated in industrialized capitalist societies characterized by considerable cultural homogeneity and relatively small economic gaps. In the absence of a balance of power between classes and castes, and a consensual unifying national identity, the automatic installation of formal democratic principles might only make matters worse. I studied political science and did a project on the "Architect of the Indian Constitution", B R Ambedkar. If anything he put in place laws that would allow more representation from all segments of Indian society. Bhimsen: "Riaz, could you cite the original source of the following quote.."
Thank you Riaz but would you not agree that Indian political institutions are more robust than Pakistan's? The army has always been under civilian control and the civilian leadership though often corrupt has never elected clowns like zardari to high office or been that rapaciously corrupt like the Bhuttos. As for whether the political system much more advanced than the society let me remind you than in 1776 the united states was effectively the bihar of the west with hardly any institutions of higher learning or intellectual achievements to its credit with a population onsisting of essentially poor and destitute immigrants from Europe.People often thought having democracy in such a backward country was a joke afterall even advanced nations like France,UK,Prussia...everybody had no such thing.But it worked didn't it? Anon: "1776 the united states was effectively the bihar of the west with hardly any institutions of higher learning or intellectual achievements to its credit with..."
The US was not much of a democracy in 1776. Only white men owning property had a right to vote and Alexander Hamilton, one of the founding fathers, believed "masses are asses". The US did not become much of democracy until FDR's "New Deal", passage of Voting Rights Act and Johnson's "Great Society" programs which opened up opportunities to the avg folks and built a prosperous middle class country. The US democracy is under serious threat again with the trashing of the Bill of Rights under Bush and the destruction of the American middle class. Huge tax cuts for the rich at the expense of the middle class are the kind of policies favored by the rich who pay the politicians to do their bidding. The neocon movement, inspired by the likes of Dr. Leo Strauss of U of Chicago, has pushed the ideas of "philosopher kings" and "noble lies" to manage the American masses. In reality, US has become an oligarchy where "corporations are people" and their "free speech" (big money) is protected by the Constitution (US Supreme Court). The "Occupy Wall Street" movement is a reaction to these excesses, and we have yet to see if it can bring changes to empower the people again. It was more a democracy than any other country in the world at that point of time. Infact the only democracy where the head of state had to stand for elections.Everywhere else there was monarchy.This is surprising considering how backward it was socially compared to the rest of Europe. Anon: "It was more a democracy than any other country in the world at that point of time." Labels are often deceptive, and so are the elections. Most Arab nations call themselves "democracy" and hold regular "elections" which have no impact on the ruling elite. For over a century in the US, only a small minority of population could vote because women, poor and blacks were excluded. Pakistan's commanders in the wild Afghan border region can return fire if under attack without waiting for permission, the army chief said on Friday, a policy change that could stoke tensions after Saturday's NATO strike killed 24 Pakistani troops. Exactly what happened in the attack is unclear. Two U.S. officials told Reuters early indications were that Pakistani officials had cleared the NATO air strike, unaware they had troops in the area. A Pakistani official denied this. The attack sparked fury in Pakistan and further complicated U.S.-led efforts to ease a crisis in relations with Islamabad, still seething at a secret U.S. raid in May which killed al Qaeda leader Osama bin Laden, and stabilize the region before foreign combat troops leave Afghanistan in 2014. "I do not want there to be any doubt in the minds of any commander at any level about the rules of engagement," Chief of Army Staff General Ashfaq Kayani said in a communique on Friday. "In case of any attack, you have complete liberty to respond forcefully using all available resources. You do not need any permission for this." A military source explained that this amounted to a change in the rules for Pakistani forces guarding the Western border against militant movements to and from Afghanistan. "In the past, we were only guarding ourselves or reacting against militants," said the source, who requested anonymity because he is not authorized to speak to the media. "We have given our posts some more space to respond. If they are under attack, they should not wait for orders from above on whether to return fire or not." The increase in autonomy for local commanders is likely to raise tensions in the unruly and mountainous border region, which is porous and poorly marked. Militants and tribespeople alike move back and forth daily. I don't understand why Indians are so jealous of Pakistan. I totally agree Indians are a nation of super poor. They are only nation that eats rat meat and drinks cow's piss. So my dear stinky Indians, you literally stink, please don't try to become an authority on Pakistani affairs, you don't qualify. So do you think this alliance can bring a sizeable Arab investment in Pakistan... Even if they invest $100 billion this can change our destiny?Do u think they will make an investment of such a size?